A kotegeashi is an outward wrist turn and traditionally is broadly categorised in Aikido as a kaiten (open and turn) technique. In the below video Morihiro Saito Sensei demonstrates how kotegaeshi may be applied in circumstances where the uke has pinned the nage’s hands behind their back. 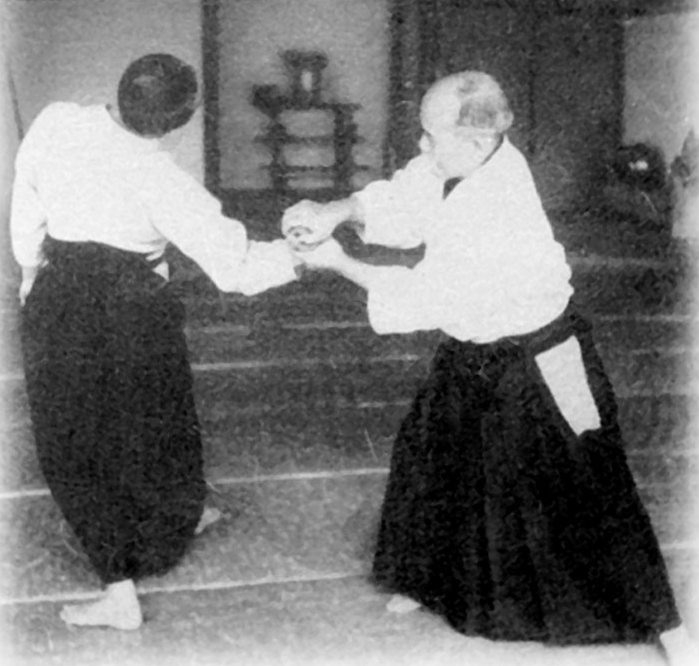 Depending on the Aikido style, the technique is referred to as Ushiro ryotedori kotegaeshi or Ushiro tekubidori kotegaeshi . In the below video, Sensei Andy Hathaway of the London Aikido Club explores the Aiki principles underpinning Ushiro ryotedori kotegaeshi . Hathaway Sensei emphasises the importance of getting off-line and the use of balance breaking principles to effectively execute the technique. These principles are particularly important where the uke has a strong grip on the wrists. In the below video, Koretoshi Maruyama Sensei demonstrates how ushiro ryotedori kotegaeshi is practised in Aikido Yuishinkai. The method of practice is typical of that found in many ki aikido schools inspired by the teachings of Koichi Tohei Sensei.